Finally, an official USA-made version of the Murray Strat is with us, and it's worth the wait. Blending a '57 Strat with rock sounds and more. A five-way pickup selector would increase the palette of sounds. As a band, Maiden were honoured with a Fender Stratocaster back in 2001 but the three new axes in this series mark the first occasion that any specific member of the six-string fusillade has been given a signature model. 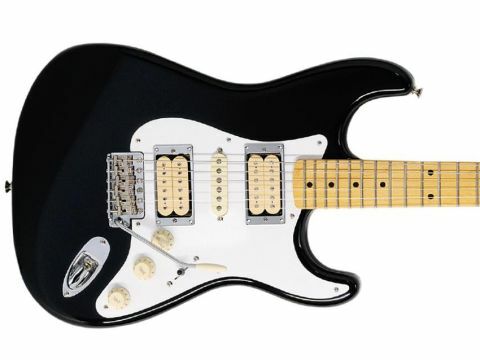 Although a Dave Murray Strat has been sporadically available via Fender Japan for a while now (the HST-57DM), this new US-built model - based on Murray's original guitar that, in turn, was previously owned by Paul Kossoff - is on sale across the globe. Like the other two guitars in this series, the Dave Murray Strat harks back to the instruments used by the respective members of Iron Maiden on 1987's Somewhere In Time tour. While the guitar is not intended as strict replica model, the spec, look and, most importantly, vibe and tone is designed to be close to the real thing. Back in 2003, Dave recounted the story of the guitar that he'd recently removed from service. "Yeah, that's been retired," he said with a smile. "I got it in 1976 through an ad in Melody Maker. I'd done some research and I thought, 'okay, this is it'. "I had a Les Paul at the time and I sold that, borrowed some money, and went for that Strat specifically because of the history behind it. "I mean, I think I used it for something like the first five albums," he continued. "But we were touring a lot and it was a case of, Well, it's done me well, y'know? The newer guitars are good road guitars." That guitar was an original 1957 Strat once owned by the late Free guitarist Paul Kossoff. Murray recorded many of Maiden's greatest songs with it and the pair of Super Distortions were, of course, retrofitted. A late fifties Strat is certainly a very attractive article and, aside from the provision of two double cream DiMarzios, this is not as far removed from an original model as you may perceive. For example, the guitar is loaded with a three-way selector (albeit topped with a black rather than white switch cap), and the maple neck offers a 'V'-shape. That said, this profile has been softened slightly and the subsequent feel, as we'll discover, does benefit the guitar's likely target audience. The chrome pickup surrounds add some suitably flashy rock credentials and, although Dave uses Floyd Rose vibratos on his current stage axes, the classic vintage 'Synchronized' vibrato is more in keeping with the original. The basic bridge rock tone isn't as dark as that of Adrian Smith's Jackson in the same 'Maiden signature series, which is interesting, but as we've said, the softer 'V' neck fills the hand far more comfortably than, for example, a Clapton Strat. Considering the complex music Maiden play, a more pointed profile could have really caused mobility problems and, as usual, the Strat is faultless in its playability. A classic rock tone enjoys an almost breathy character that, when used for solos above the 12th fret, offers just the right amount of treble cut. When the volume is backed off a touch, there's a lovely warm and bluesy character to the sound. However, Murray is best known for his soulful solo use of the neck humbucker and, with a DP-103 (DiMarzio's version of the PAF) in that position here, the trademark tone is instantly evident, especially when it's put through our test Marshall. The guitar's versatility is cemented by the ability to select the central single-coil easily and, with a more subdued tone, the guitar certainly possesses a number of more subtle voices even though no pickup combinations are possible. The use of a five-way switch would have increased that number. Compared to a Jackson, tuning is obviously more of a potential issue here due to the lack of locking parts - Murray enjoys his strenuous dive-bombs too - but take the customary string-stretching steps and the guitar will be with you every step of the way. The six-strings in this new series offer a lot more than guitars for Maiden fans. They are both great rock axes that have quality oozing from every fret. Yes, they are pricey, but we'd suggest that each offers enough of its own merits and exclusivity to be worth it: these are high-end US signature guitars, after all. The Dave Murray Strat - although far more traditional in vibe - is different enough in both tone and feel to a traditional hot-rodded Strat to ensure a level of popularity outside Iron Maiden fans. It's versatile, plays wonderfully and offers more than its fair share of impressive and individual tones.